"Whoever said that sin was not fun? Whoever claimed that Lucifer was not handsome, persuasive, easy, friendly? Whoever said that sin was unattractive, undesirable, or nauseating in its acceptance? "Transgression wears elegant gowns and sparkling apparel. It is highly perfumed, has attractive features, a soft voice. It is found in educated circles and sophisticated groups. It provides sweet and comfortable luxuries. Sin is easy and has a big company of bed fellows. It promises immunity from restrictions, temporary freedoms. It can momentarily satisfy hunger, thirst, desire, urges, passions, wants, without immediately paying the price. But, it begins tiny and grows to monumental proportions. It grows drop by drop, inch by inch." 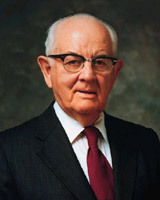 I was 16 years old when President Kimball became the president of the Church. As a youth, I was always eager to hear him speak because of talks like this one (though it was given a few years earlier than that). He often shared very practical counsel, but with a way of expressing that was beautiful and inspiring. I learned to listen beyond the soft, raspy voice that was a result of throat cancer, and hear the power of his expression even when the delivery was not so powerful. It was a good lesson. In this talk, President Kimball spoke of the mistletoe plant, that grows as a parasite on other trees. It starts as a small, attractive plant, but can eventually take over and destroy the whole host tree, sucking all the nutrition and energy from it. His analogy was to the way sin can overtake our lives—at first small and subtle, but then overpowering in impact. 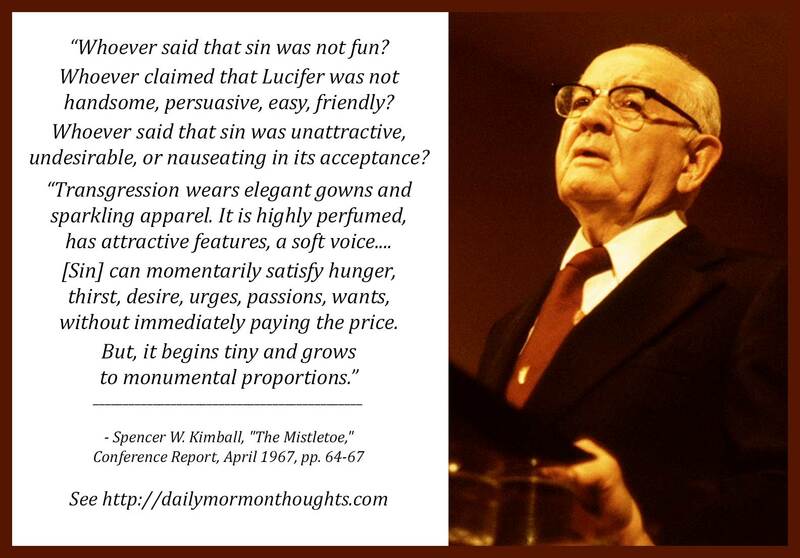 In our time, 50 years after these words were first shared, the lures of Lucifer and his distractions are even more subtle and dangerous, and perhaps even more powerful in destroying life and hope. How carefully we must heed the prophetic warnings as they help us see the dangers that lie ahead from the "elegant gowns and sparkling apparel" of the world's ways!